When was a kid, I often thought that having a birthday around Christmas would have been the best. However, I was quickly informed that it isn't all that great because there are only so many presents that your parents can afford. I now think if I were a kid again I would be wishing to have my birthday near Halloween. 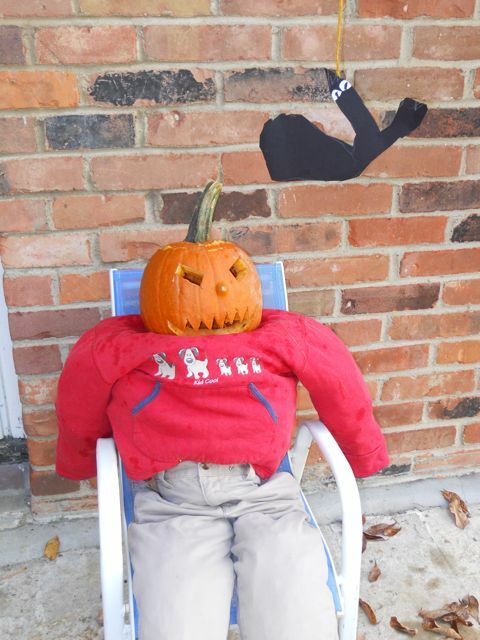 By itself, Halloween has candy, costumes, and parades at school. Then, if you could add presents, cake, and a birthday party it would be fabulous! This week we had the perfect match of a birthday celebration and a holiday when we read Pumpkinhead and Bone Dog by Eric Rohmann. Eric Rohmann is also the author and illustrator of Time Flies, a Caldecott Honor Book and My Friend Rabbit, a Caldecott Medal Recipient. These two Caldecott books couldn't be more different. Time Flies is a wordless picture book illustrated with oil paintings that tell the story of a bird on mysterious journey through a natural history museum. My Friend Rabbit is a story of friends getting into trouble together that is illustrated with hand colored relief prints, an art technique that Rohmann had done in school. He recently said in a video on Kathi Appelt's blog Calloo Calley that, "Each story deserves a picture that rhymes with the way the story is told." He continued by saying, "If it is in you to tell different kinds of stories, you are going to have to make different kinds of pictures." My son loved reading both of these books this week -- despite their differences. 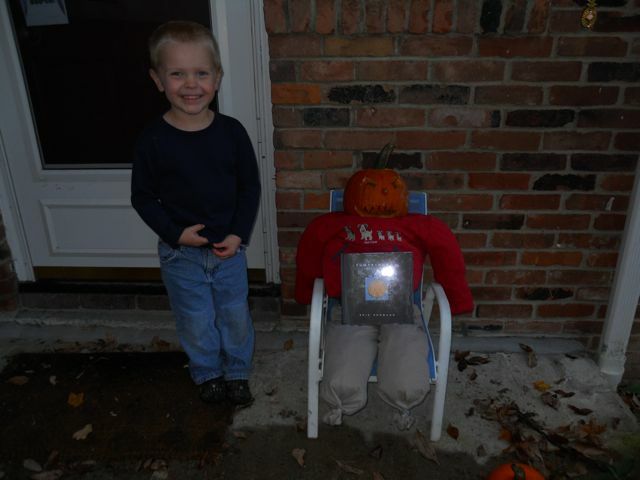 The book we focused on this week for our birthday celebration activity was Pumpkinhead. I really liked the uniqueness of the story. 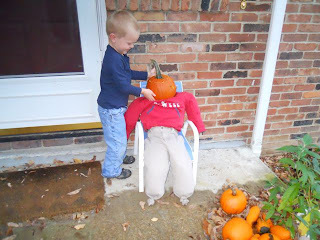 A boy named Otho is born with a pumpkin for his head. One day a bat grabs his head because it thought it would make a great home. However, Otho's head is just too heavy for the bat to carry as it flies and the bat drops it in the sea. The adventure continues with various other predicaments that eventually lead Otho's pumpkinhead back home to his loving family (and his body!). 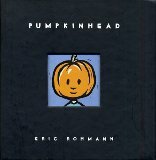 Eric Rohmann spoke of his book Pumpkinhead in an interview with Reading Rockets, "You put it out into the world and somebody uses it some way. Once it leaves the studio it's not yours anymore; it's everybody else's and they find their way to it or they don't." In the interview, Rohmann shared that one of his readers used Pumpkinhead in a pediatric burn unit because she liked the message that life can be hard for a boy who looks different but the unconditional love provided by a family "can suit him just fine". Our way of using Pumpkinhead was to make our own Otho out of clothes we had outgrown, the leaves in the backyard that we are tired of raking, and a carved pumpkin. We found a pair of pants and a sweatshirt in the basement that seemed like the right size (4T) for our "Otho". 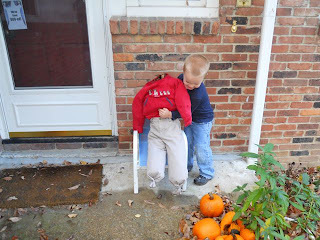 We tied off the legs and stuffed them with leaves from the backyard. 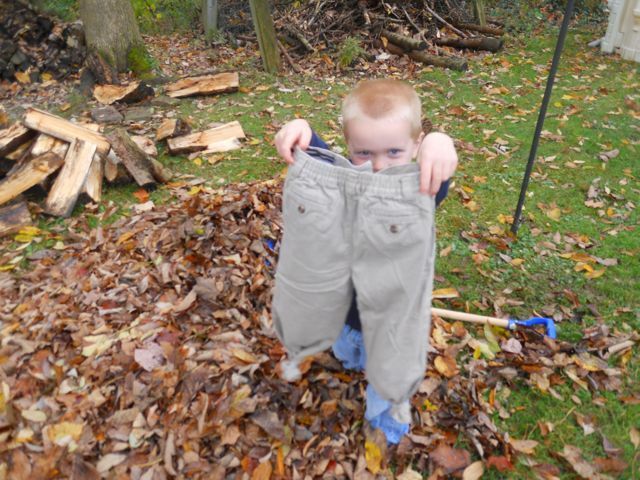 My son was determined to use a snow shovel to fill the pants. It wasn't the most efficient method but it worked. After filling the pants I realized it would be wise to attach the sweatshirt to the pants so we could continue stuffing the leaves. 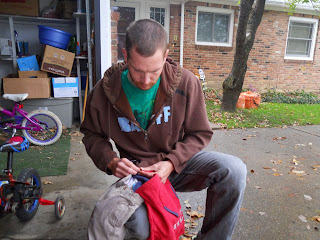 In this photo, courtesy of my son, I am attaching the pants to the sweatshirt with safety pins. 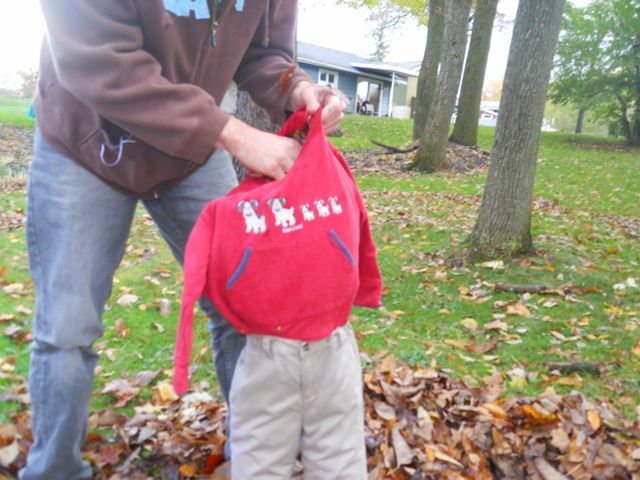 My son continued his camera duties as I stuffed the sweatshirt. Don't forget to stuff the arms -- I almost did! My son was surprised how heavy a bunch of leaves could be as he set "Otho's body" in the chair. He added the carved pumpkin for the head and Otho was complete. After taking this picture, I said, "I need to go inside for a second to see if your brother is awake from his nap." He responded, "You don't have to. Otho is listening for him." 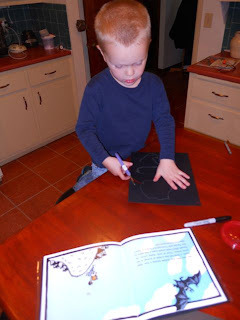 I think I loved this activity as much as my son! We had a bat decoration in the basement that I thought we could bring up to add to our Otho display but my son wanted to make his own. So he drew a bat with a grey crayon on black construction paper and cut it out. The bat was hung from the awning above. Watch out Otho! If you are looking for more books by Eric Rohmann that tie into the Halloween season check out his latest book Bone Dog and there is also a mention of Halloween in Clara and Asha. Thanks for this blog. I have been following you for some time now. I love the focus. 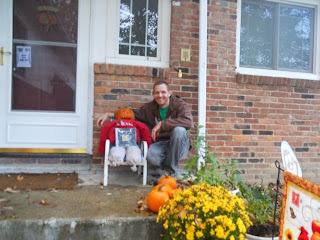 I will be having my 2nd Blog anniversary and hope you can stop by my blog party tomorrow.